Z. Berman Books is currently the largest retailer of Jewish books in the world. Started 50 years ago out of the back of a traveling Station Wagon, today the business has grown to 7 retail stores throughout the Tri-State area. 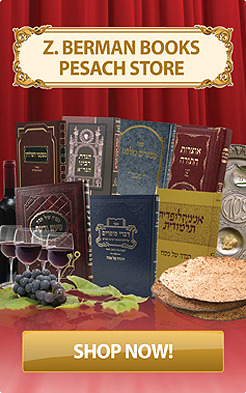 Z Berman Books also exclusively publishes many best selling Seforim through 2 publishing companies it has acquired in Israel. A 6,000 square foot warehouse in Brooklyn serves its large wholesale business. This Warehouse enables us to stock thousands of Seforim, all of which are available for immediate shipment.